Striatal-enriched tyrosine protein phosphatase (STEP) is expressed mainly in the brain. Its dysregulation is associated with Alzheimer’s and Huntington’s diseases, schizophrenia, fragile X syndrome, drug abuse and stroke/ischemia. However, an association between STEP and depressive disorders is still obscure. The review discusses the theoretical foundations and experimental facts concerning possible relationship between STEP dysregulation and depression risk. 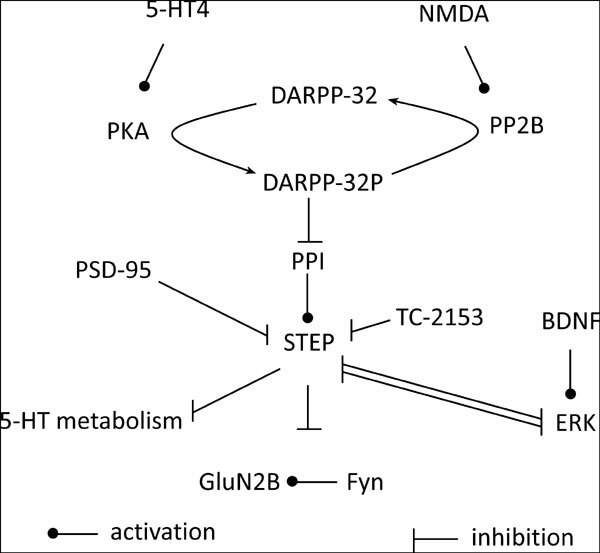 STEP dephosphorylates and inactivates several key neuronal signaling proteins such as extracellular signal-regulating kinase 1 and 2 (ERK1/2), stress activated protein kinases p38, the Src family tyrosine kinases Fyn, Pyk2, NMDA and AMPA glutamate receptors. The inactivation of these proteins decreases the expression of brain derived neurotrophic factor (BDNF) necessary for neurogenesis and neuronal survival. The deficit of BDNF results in progressive degeneration of neurons in the hippocampus and cortex and increases depression risk. At the same time, a STEP inhibitor, 8-(trifluoromethyl)-1,2,3,4,5-benzopentathiepin-6-amine hydrochloride (TC-2153), increases BDNF expression in the hippocampus and attenuated the depressivelike behavior in mice. Thus, STEP is involved in the mechanism of depressive disorders and it is a promising molecular target for atypical antidepressant drugs of new generation. Keywords: STEP, TC-2153, depression, antidepressant, serotonin, BDNF, NMDA receptors. Keywords:STEP, TC-2153, depression, antidepressant, serotonin, BDNF, NMDA receptors. Abstract:Striatal-enriched tyrosine protein phosphatase (STEP) is expressed mainly in the brain. Its dysregulation is associated with Alzheimer’s and Huntington’s diseases, schizophrenia, fragile X syndrome, drug abuse and stroke/ischemia. However, an association between STEP and depressive disorders is still obscure. The review discusses the theoretical foundations and experimental facts concerning possible relationship between STEP dysregulation and depression risk. STEP dephosphorylates and inactivates several key neuronal signaling proteins such as extracellular signal-regulating kinase 1 and 2 (ERK1/2), stress activated protein kinases p38, the Src family tyrosine kinases Fyn, Pyk2, NMDA and AMPA glutamate receptors. The inactivation of these proteins decreases the expression of brain derived neurotrophic factor (BDNF) necessary for neurogenesis and neuronal survival. The deficit of BDNF results in progressive degeneration of neurons in the hippocampus and cortex and increases depression risk. At the same time, a STEP inhibitor, 8-(trifluoromethyl)-1,2,3,4,5-benzopentathiepin-6-amine hydrochloride (TC-2153), increases BDNF expression in the hippocampus and attenuated the depressivelike behavior in mice. Thus, STEP is involved in the mechanism of depressive disorders and it is a promising molecular target for atypical antidepressant drugs of new generation.